In this game you only have one goal! Smuggle the gun inside and shoot The Snitch... Unless you are the snitch of course. 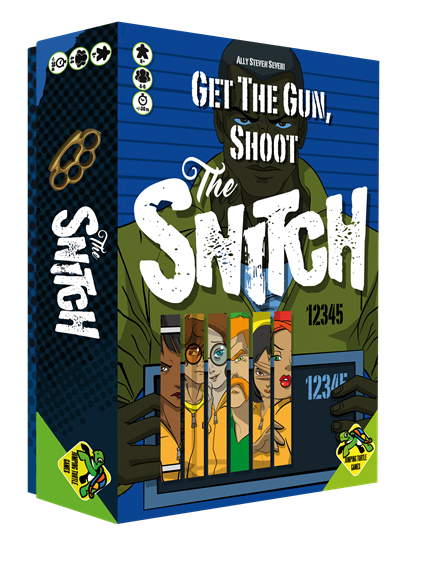 At the start The Snitch is a fully co-operative game that could turn into a semi-co-operative game at any moment. The players are all prisoners and they are planning their great escape. If they want to escape they have to succeed in several schemes. A scheme is succesful when you bring together enough different prison contacts. But everything has to be organised in secret. The other players send you contacts who'll contribute to your scheme and they'll tell you who they are but you can't see them yet. During the game a player isn't always allowed to talk, so there is a chance you can't be told who is joining your scheme. As soon as you have gathered enough contacts one random contact will join your scheme and you'll check you succeeded or failed. As long as all schemes succeed everything goes as planned, but as soon as a scheme fails the guards are getting suspicious and the person who was responsible will have to draw cards of the interrogation deck. There is a chance the guards will convince you to become a snitch. When this happens your only goal is to make sure the other players don't escape. As more schemes fail tension will build. Can you still trust the other inmates or are they lying to you?